Hallelujah!!! That witch named Hurricane Sandy finally booked it out of town and the rain is slowly coming to an end. Good riddance! It's been seven days of rain and I gotta tell ya...it's so nice to get back outside! I don't know how you folks on the west coast do it. With only a few scattered showers still lingering around, I took the opportunity to do some grilling. 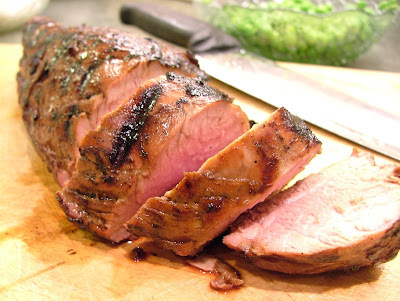 What I grilled was a pork tenderloin I had marinated in a sesame and ginger based marinade. The marinade was an adaptation of a sauce I had used in a sesame noodle dish not long ago. I bumped up the quantity of both the ginger and the toasted sesame oil and it ended packing more punch than I thought it would! Grate Fresh Ginger with LESS effort! This recipe calls for grated fresh ginger which can be a hassle to grate because it gets stringy. The quick fix is to store it in the freezer. It keeps the ginger from spoiling and it's much easier to grate when frozen. I don't even bother peeling it when I use it in marinades. 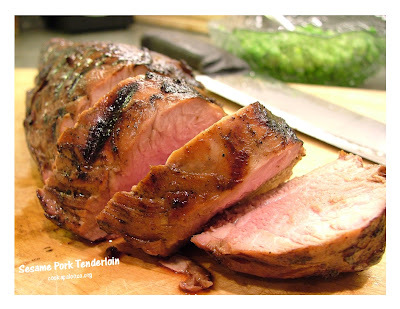 I only marinated the pork for an hour and it was singing with a whole lotta flavor after grilling it! There's really no reason to keep this recipe cooped up for a special occasion. It's a quick one to prepare for a mid-week meal plus it gives you a chance to get outside after a long day and take in some fresh fall air while you grill. Just don't forget your headlamp! Sesame and ginger work their magic together in this tender and flavorful meat dish. To make marinade, in a small bowl, whisk together soy sauce, sugar, oil, ginger, vinegar, hot sauce onions and garlic. Place pork in a large resealable plastic bag. Add marinade. Seal bag and turn several times until pork is coated with marinade. Marinate in the refrigerator for at least 1 hour. Preheat grill to medium setting. Grill turning and brushing occasionally with leftover marinade, until pork is slightly pink in the center, about 10 to 15 minutes. Let rest 5 minutes before serving. Like this recipe? Pass it on using the buttons below!